ATTENTION: RANCHO ROAD IS NOW A TWO-WAY TRAIL BETWEEN RIDGE PASS AND TOYON. Upper Ranch is under FULL CLOSURE from Thursday, April 25 through Saturday, April 27, and a PARTIAL CLOSURE on Sunday, April 28 for a special event. To view a closure map, please click here. Park Hours/ Vehicle Operation Hours: sunrise to sunset. Park is open 365 days a year including holidays. CLOSED - For public safety and resource protection, everything on adobe soil is closed during severe muddy conditions. Hollister Hills State Vehicle Recreation Area (SVRA) is California State Parks’ first SVRA. 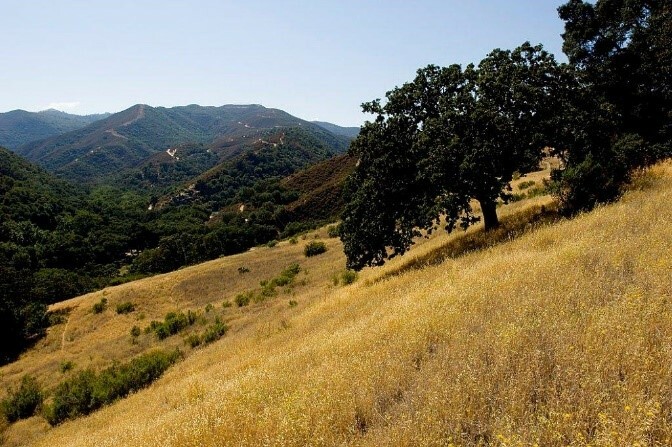 Located in the Gabilan Mountains, just an hour’s drive south from San Jose, this unique SVRA features over 6,800 acres of scenic and varied terrain. Visitors are drawn to the natural beauty of the park’s oak woodlands, rolling hills, lush canyons, and seasonal creeks with elevations ranging from 660 feet to 2,425 feet. 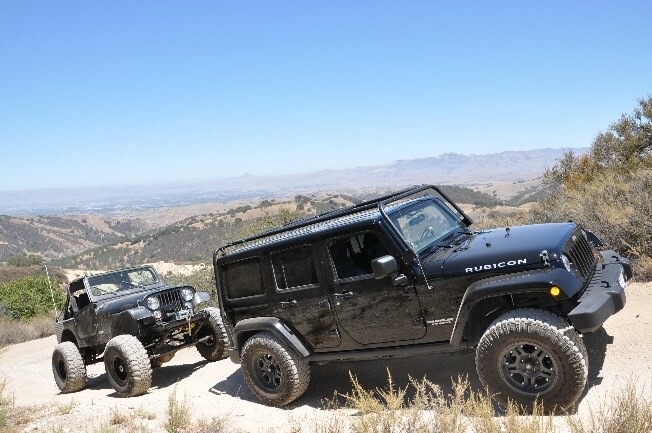 Hollister Hills SVRA offers numerous off-highway vehicle (OHV) opportunities as well as designated hiking, bicycling, and equestrian trails. The park straddles the San Andreas Fault. The North American tectonic plate (North East side) consists of clay-rich adobe soil with rolling hills covered in grassland and oak woodlands. The Pacific tectonic plate (South West) consists of granitic soil with steeper terrain with pine, sage, and chaparral taking root in the sandy soil. The Pacific and North American tectonic plates have been sliding past each other for 30 million years at a current rate of about 1.5 inches per year. To read more about this geological gem, click here. *This unique geography creates a variety of riding terrain, but each soil type requires different care and maintenance. Please call the park ahead of time. Howard Harris created the foundation of what today is known as Hollister Hills SVRA. Howard’s great grandfather, Jesse Whitton, was a civilian surveyor for the John C. Fremont expedition that traveled through the area in 1846. After the expedition, Jesse Whitton returned to the area and successfully purchased 600 acres for $50 per acre. The land was passed on through the family and finally to Howard Harris in 1959, who became the last private owner of the property. In the following years, Howard purchased more of the surrounding properties and built many of the park’s trails and roads. He used the land for a number of activities including mining, farming, ranching, hunting, scientific studies, and OHV recreation. OHVs were first used on the ranch in 1947 when Howard established the Bird Creek Hunting Club. Jeeps, motorcycles, and “tote-goats” were used for transportation to get around the ranch. During the 1950s, private OHV activities were held and by 1970, the ranch was officially opened for public OHV recreation. Howard managed the land as a motorcycle park until October 1, 1975, when the land was sold to the State of California and became Hollister Hills SVRA. *Four-wheeled vehicles include jeeps, trucks, and side-by-sides/ROVs. ATV’s or motorcycles are not allowed in these areas, only in the lower ranch. 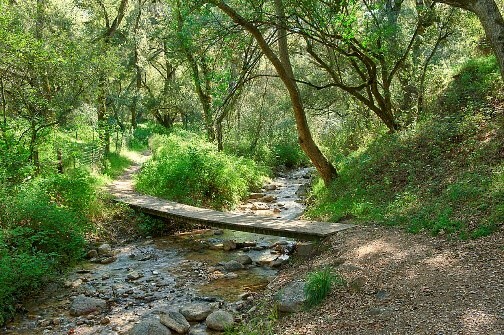 Upper Ranch - This 800-acre area offers about 24 miles of trails for four-wheel drive recreation. There is three specialized areas (4x4 Obstacle Course, Adventure Track, and special event G.P. Track) that provide a range of challenges and obstacles. To use the area for the day, register first at the park office to obtain the gate combination. If your vehicle gets stuck or breaks down, you are responsible for removing it. *Please note that on occasion, the Upper Ranch may be partially or entirely closed for special events. Please click here for a list of current special events and corresponding closures. 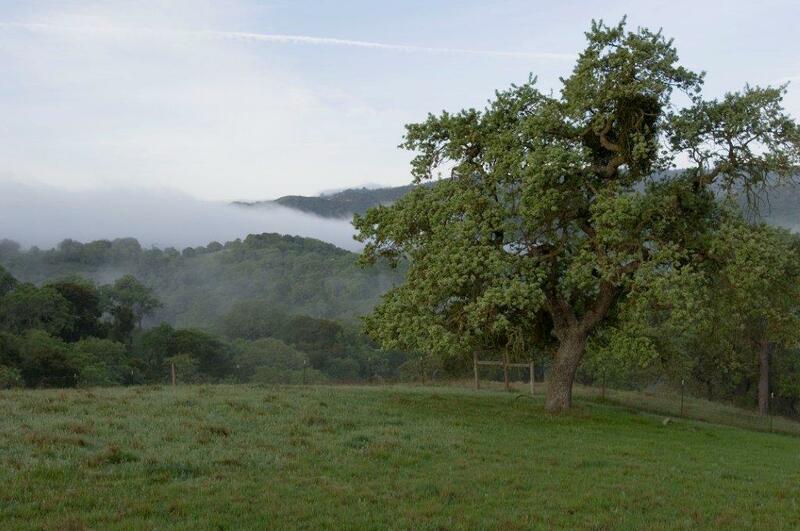 Hudner Ranch - This 1,500-acre area offers trails that wind through rolling hills and oak grasslands with panoramic views. Please note the majority of these trails are narrow (except Hudner Pass and Valley Vista) and are recommended for shorter vehicles such as Jeep, Land Rover, Toyota and ROV’s/Side by Sides. This area is subject to seasonal closures due to the adobe soil for safety and to help prevent erosion. Please call the park to confirm. Lower Ranch – This 3,300-acre area, set aside for motorcycle and ATV use only, has about 128 miles of trails and several hill climbs. Additional OHV opportunities include a vintage track, two practice motocross tracks, ATV track, TT track, intermediate kids track, beginner area, and a track for bikes and ATV’s with an engine size of 90cc or less. Next to Walnut and Lodge Camps there are two children’s areas set aside only for smaller motorcycles and ATVs with an engine size under 90cc. 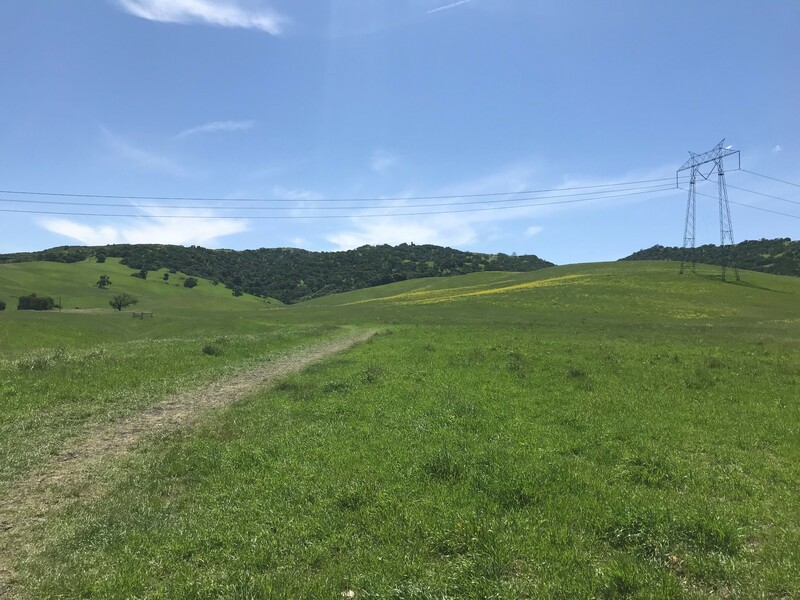 Renz Ranch is located within the Lower Ranch, this 1,600-acre property features predominately single track trails complete with frequent grade changes and rolling trail contours. This unique topography is due to being located on the North American tectonic plate and is mostly consistent of adobe soils. This area is subject to seasonal closures due to the adobe soil for safety and erosion control. Please call the park to confirm. Nature Area – Located in the Lower Ranch, this 300 acre area has approximately 5 miles of non-motorized multi-use trails for hiking, bicycling, bird watching, and dog walking. The entrance is positioned at the end of Madrone camp. Dogs on leash are welcome. Mudstone Ranch - This non-motorized section of the park offers 13 miles of multi-use trails and is shared by equestrian, hikers, and mountain bikers alike. The park created this buffer area in order to reduce the potential for noise and dust reaching the neighboring communities from motorized trails. Dogs on leash are welcome. *Please be aware of the electric fence. Hollister Hills SVRA utilizes cattle grazing for resource management of invasive plant species, and to minimize the severity of wildfires through fuel reduction. During peak grazing periods, cattle herds are rotated through designated pastures with an electric wire fence. Please leave the gates as you find them (either open or closed). RED STICKER OPERATION is from OCTOBER 1 through MAY 31. Click here to learn more about red sticker riding season. Registration: All vehicles operated off-highway on public lands in California are required to be street-licensed or registered as an OHV through the Department of Motor Vehicles and display a current green or red sticker. Funds generated from OHV registration are used for acquisition, development, and operation of OHV areas. For more information and about nonresident ORV permits, please click here. Spark arresters: each OHV must have a U.S. Forest Service approved spark arrester in good working order and in place at all times. For more information, please click here. 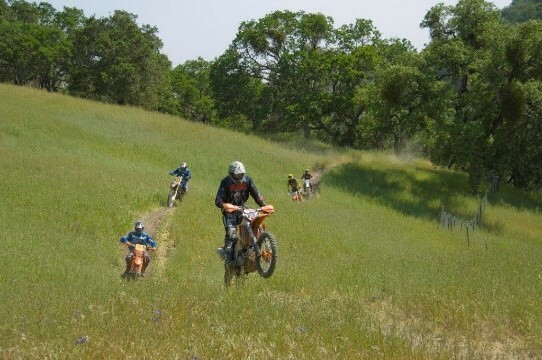 To read more about OHV laws and safety, please visit our California State Parks OHV Laws/Safety page here. Relatively flat, these trails or fire roads provide a good starting point for beginners. Steeper and narrower, these trails usually have plenty of room to turn around at the top or bottom or have an outlet so that riders can avoid returning on the same route. Steep and narrow, these trails often do not have an outlet; therefore, riders must be able to negotiate the trail in both directions. Only the most experienced riders should travel these routes. Events: We offer a variety of ranger-led education activities & host a wide array of special events. For a list of upcoming events, click here. Dogs are allowed on a tended 6 foot leash or confined in an enclosed vehicle, tent or pen. Dogs, other than service animals, are prohibited on all motorized trails. Dogs are allowed in the Nature area and Mudstone Ranch. Equestrians are allowed in Mudstone Ranch only. Camping is offered in the Upper Ranch (2 campgrounds), the Lower Ranch (4 campgrounds), and the Hudner (2 remote sites that require special access permits). For more information on camping, please click here. Fires are permitted in state provided fire rings. No ground fires allowed. This is necessary to prevent disastrous fires. Portable stoves may be used in designated areas. It is the responsibility of every visitor to use extreme caution with any burning materials, including tobacco. 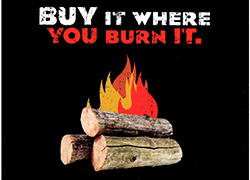 Campfires are not allowed in Hudner Ranch during fire season (summer & fall). Loaded firearms and hunting are not allowed in units of the State Parks System. Possession of loaded firearms or air rifles is prohibited. Grazing: For many years Hollister Hills SVRA has relied on holistic cattle grazing in the buffer areas as a tool used for resource management including invasive species suppression and to minimize the severity of wildfires through fuel reduction. These important resource management practices will continue with public access to Mudstone Ranch through coordination of park staff and the cattle grazing operator. Professional/Commercial Filming andPhotography in all California State Parks Requires a permit through the California Film Commision. Fill out the online application at www.film.ca.gov.